Manually add staff members or invite them via email invitation. Important: If a staff member is added manually, you will not be able to invite them by email and vice versa. This is to prevent duplicate accounts. Go to Staff in the primary navigation and click the Add Staff Manually button. Enter new staff member details including the email and password they will be using to log into their TheraNest account. Click Save Details when complete. The staff member must use the email address and password saved to their details when initially logging into their account. These fields can be updated by the staff member at any time. Go to Staff in the primary navigation and click the Invite Staff by Email button. Type the staff member's first name, last name, and email address. You can also assign basic permissions. You can invite multiple users at a time when inviting staff members by email invitation. Click Send Invitations. Your staff member will receive an email similar to the one below. 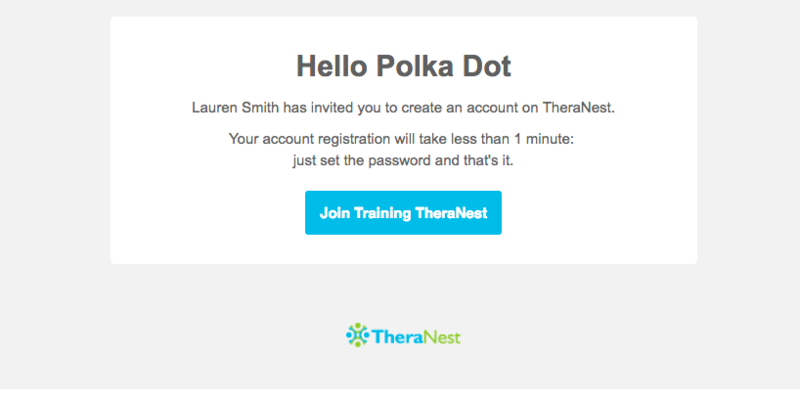 By clicking the link in the invitation email, their account will officially be created and they can start using TheraNest. - How to assign staff member's permissions?